Discover paradise on this short Guatemalan break. 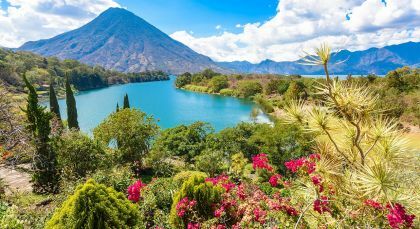 Home to the most picturesque lake in Central America – Lake Atitlan, the country offers incredible opportunities for active excursions in the beautiful outdoors and birdwatching. 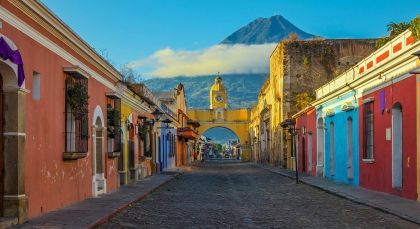 In vibrant Antigua and picturesque Flores, uncover Guatemala’s centuries old history! Antigua is the perfect city to travel back in time while staying grounded in the present! Sounds contradictory? That’s Antigua for you! 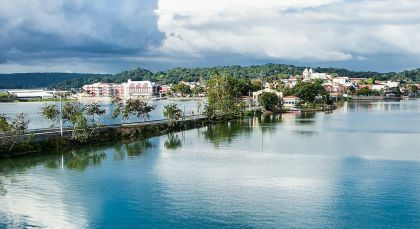 Explore the historic ruins and period architecture of the distinctive Guatemalan city of Antigua on this day tour. Discover the many Spanish colonial churches that Antigua is home to. Amble along the old city’s paved streets and alleyways, peeking into stories and legends from bygone ages. Visit the La Merced Church and the Central Park, before stopping by to explore Antigua’s Main Cathedral and its ruins. 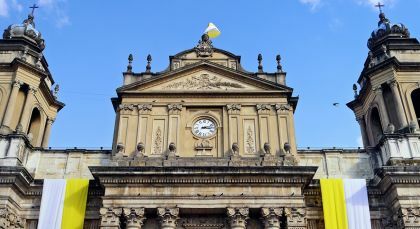 Drop by the San Francisco El Grande Church, as well as the Convent Capuchinas on this leisurely tour of the city’s old churches and chapels. Spice up your day with a little trip to a local crafts market, admiring the various handcrafted artefacts on display and interacting with local artisans. Wrap up your city tour on a sweet note by dropping into the Chocolate Museum (yes, such a place does exist on this planet!). (Half Day; Time of Day: Morning or Afternoon; Duration: 4 hrs; Fitness Level: Easy; Please bring comfortable walking shoes). Enjoy a day of mountain biking along the picturesque countryside surrounding Antigua on this adventurous excursion. Ride along the spectacular landscape of the Almolonga Valley, before pedalling it over to the beautiful highland villages of Santa Ana, San Juan del Obispo, and San Pedro Las Huertas. Ride over to Guatemala’s former second capital, Ciudad Vieja, which was buried by a mudslide in the 16th century. Visit an experimental, local macadamia farm along the way, before riding back to Antigua. (Half Day; Time of Day: Morning; Duration: 4 hrs, 0900-1300 hrs; Shared Activity & Transfer; Fitness Level: Moderate. Note: Expect bike with helmets, bottle of purified water, and a bilingual English and Spanish guide). Lake Atitlan, or Lago de Atitlán, impresses most travelers with its scenic beauty. This city offers lovely views of a volcanic lake hemmed in by velvety green volcanic hills. Spend a refreshing day boating on Lake Atitlán and visiting some sites to get to know local cultures and lifestyles a little better. After breakfast at your hotel, set out for a leisurely boat ride of about half an hour across Lake Atitlán. Ride out to the village of San Juan La Laguna to visit a women’s textile cooperative. Watch how colorful fabrics are hand woven and dyed naturally before the traditional handloom is ready for the market. Learn about the local artistic community when you drop by the studio homes of the region’s famous naïf painters. A Mayan encounter awaits you at the town of Santiago, where you learn about the age-old culture and tradition of the T’zutujil Maya. Get to know more about the traditional handicrafts, ancient belief system and spiritualism of the local community, before returning to your hotel. (Half Day; Fitness Level: Easy; Please bring comfortable walking shoes and a wind-breaker). Enjoy a wonderful kayaking experience across the imposing Lake Atitlán on this day trip. Discover secret nooks and crannies, hidden coves and verdant lakeside vegetation as you kayak along the calm cerulean waters. Soak in the natural beauty of the surrounding highland landscape. Relax, sit back in your kayak, and just enjoy your ride. (Half Day; Time of Day: Morning; Duration: 1.5 hrs; Fitness Level: Easy; Please bring waterproof sandals or shoes). Flores is one of the oldest inhabited towns in the Americas. The original island town of Nojpetén was built in the 13th century by the Mayan Itza on Lake Peten Itza (or Lago de Petén Itzá). Set off early in the morning from Flores on your trip to Yaxha National Park. Your guide will lead you across this archaeological site which was a flourishing city thousands of years ago. Learn all about the different structures within this ancient city as you walk around taking in the views. As this is located in an ecologically important region with lakes and wetlands, you will see quite a few bird and animal species during your visit. Enjoy a delicious lunch at the El Sombrero Lodge as you gaze upon the shimmering water of Lake Yaxha. (Full Day; Time of Day: Morning; Duration: 7 hrs; Private Activity & Transfers; Includes lunch without drinks; Fitness Level: Easy). Lose yourself in the effervescent buzz of Guatemala City, or Guate as the locals call it. This Central American capital city is split into multiple zones that are so different from each other that they may as well be separate towns!